Free or wild camping in Albania is easy and legal and there are plenty of great free camping spots along the coast. If you’re on a roadtrip through the Balkans, Albania is definitely a place to visit. And if you have a van or tent it is very easy to travel Albania on a (very small) budget. These spots are for free camping in Albania in a van but many of them are possible with a tent too. We were in Albania in September, just as the season was closing. As a result the Albanian coast was mostly empty and we had many of the beaches to ourselves. We spent 2 and a half weeks wild camping on the Albanian coast,swimming in crystal clear waters, relaxing on deserted beaches and enjoying stunning sunsets. So we have collected a list of our favourite places to wild camp in Albania, how to get there and what you can expect there. Before you head off on your wild camping adventure check out our essentials for living in a van. If you’re in the North of Albania you should spend some time in Shkoder and also consider hiking Theth to Valbona before relaxing on the beach. This little beach was completely abandoned when we were there. Only a few workers from the local bars were there to close up for the season. We heard that it is also a quiet beach even in the peak season and there is not a lot around so I imagine free camping is easy all year round. Ok for tents: Yes in September, possibly the rest of the season. Toliet situation: None, unless you ask the local beach bars. Showers: None that we saw. Shade: None on the beach but there were trees further back which may have had possible parking spots. This was a great spot for exploring nearby Durres and camping on the beach, we ended up staying three nights. Parking is under pine trees and there are many nearby bars and restaurants. There are people around throughout the day and evening but nobody minded and the nights were peaceful. This is a public parking area so free camping in peak season should also be ok.
Ok for tents: Unsure, there’s definitely space and no signs against it. Toilet situation: You can access the toilets at the bars without having to buy anything. Showers: There are lots of freshwater showers along the beach. We washed and filled up water for dishes and washing without problems. Wifi access: In the cafes and bars, none that reached the van. Shade: Completely shaded under the trees. This area is through a national park. You’ll drive through a leafy forest area and come out at a wide beach. Be careful how close to the sea you drive as another van got stuck when we were there and needed to be towed out. Huge long coast area with lots of space. It may be busier in the summer but there is so much space that parking overnight shouldn’t be a problem. Showers: None that we found. We used our solar shower for a wash! Shade: You can park in the treeline before the beach but otherwise it’s very open and flat. As it was the end of the season here, the bars and restaurants on this little beach were closed apart from one. We free camped under the pine trees and enjoyed a beer at the little bar. No one else in sight. In the height of summer I imagine this area is much busier but again, this is a public parking area so it would be possible to stay overnight. Ok for tents: Yes, at this time in the season. Toliet situation: There were toilets out the back of the bar but the water had been cut off. Otherwise there is plenty of forest. Showers: There was one by the bar but we didn’t use it. Wifi Access: The bar had good wifi that we managed to use in the van. This is a small stretch of beach consisting of restaurants, a strip of parking and the beach. Most places were closed while we were there and it was fine to stay for a night but not great for longer. Ok for tents: Not really. It may be possible to pitch a tent on the beach but there are no other sheltered areas. Showers: There were a few showers along the beach. Wifi Access: We guessed the password to one of the nearby restaurants. This is a popular, chilled beach which requires a 20 minute walk to get to. There are signs that forbid free camping on the beach but people were doing it anyway. There is also a ‘campground’ on the beach which looked very basic. If you have a 4-wheel-drive it is possible to drive onto the beach and stay there, otherwise you can park overnight in the carpark. Be prepared to pay the lady 200L for a day’s parking and another 200L for the night although she’s not very persistent if you refuse and drive away. Toilet situation: There were some toilets at the beach. Showers: There were signs to some at the campground but we didn’t use them. Shade: Not a lot down at the beach but some trees up at the carpark. This was probably our favourite spot for wild camping in Albania and was more of an unofficial campground. It’s a large area of stony beach next to a small tourist town. It’s a very relaxed area with a couple of shops, restaurants and three campgrounds. There were about 10 other vans parked at the beach while we were there and no one seems to mind. The water is crystal clear and there are also some stunning smaller bays that you can walk to over the hill. Toilet situation: There is a bar on the beach or plenty of shrubbery. Showers: Plenty at the nearby bars. Wifi Access: We used the wifi from the beach bar which reached our van. Shade: None. Make sure you invest in some good sunscreen! This was not an easy place for free camping. The road doesn’t run along the beach like in other areas and the beaches are small and mostly attached to a hotel. We ended up parking in the parking lot of an abandoned disco. There was also a public parking area and a campground. It was right at the beach but not nearly as relaxed as many of the other places we found further north. Toilet situation: The beach area is run by the neighbouring hotel and campground which both have toilets. Showers: There is a shower around the side of the hotel. Wifi Access: Also available from the hotel or campground. Shade: A few trees around. 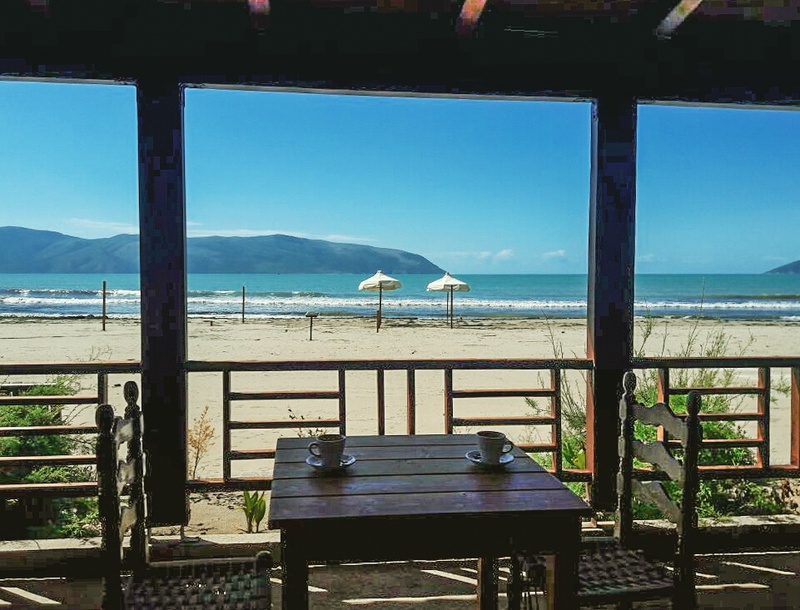 There are so many opportunities for free camping in Albania, why stop at just the coast?! We continued our journey inland and found a couple of noteworthy spots. This is one of two Blue Eyes in Albania. It is a clear, blue water spring over 50m deep, the water is ice cold but beautiful for swimming. There is also one in the north near Theth and it’s worth visiting at least one on your trip. This one is easier to get to unless you are heading to Theth for hiking. It costs 50L per person and 100L per vehicle to get to the carpark next to the blue eye but you can easily park there overnight. Picture of our friend Alex from TravelNotes360 travelling the world in their converted truck! This is #vangoals!! We came across these by accident but are so glad we did. Again, you will pay a small fee (200L) to park and visit the pools. But there is plenty of space to camp. There are 3 main pools to enjoy and a small café next to them. Tents and all kinds of vehicles are welcome. *Don't pay the guy who comes around in the evening with the receipts without official stamps. Wait until the official guy comes in the morning. These were our favourite places to wild camp in Albania but of course we parked in lots of less beautiful places too. As well as splashing out on campgrounds every now and again for a proper shower and some decent wifi. This post contains affiliate links. if you buy something through one of those links I will make a small commission at no extra cost to you. Thanks for your support!